I’ve been altogether too sociable to do justice to one of the initial aims of this blog, but for that I will not apologise. Deliberately shunning the company of others just to fulfil the parameters of a web diary would be akin to giving up a decent lover because you’d bought new batteries for the ‘ahem’ bedside drawer. But I actually felt a frisson of excitement in the Margaret Street Blood Donor Centre recently when I realised I had 90 minutes to kill. The anticipation was underpinned with the reassurance that in parting with 500g of my best claret, I had done something deserving of more than the glass the barley water and petticoat tail generously offered to me by the marvellous Nurse Alice . I was in the centre of town. There were so many options: I pondered heading to Grain Store in Kings Cross, but someone I knew was there and he’d think I was stalking him. Then I thought about the still sparkly and yet-to-be-visited Brasserie Chavot but worried I was under-dressed. 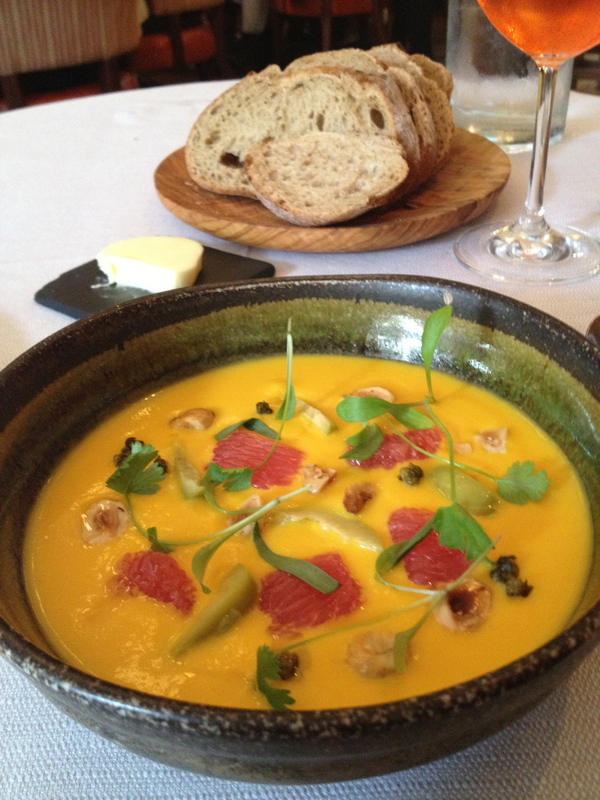 What about doing a cheeky walk-in at Pollen Street? Wasn’t sure there was a prix fixe, so scratch that. There were the stool-perching possibilities of Meat Liquor or Bone Daddies or even a trip up to Honey & Co which had tweeted about cancellations earlier, but that was a high-risk strategy. The choices were bewildering. So I did what I always do in times of stress and went back to an old favourite: Wild Honey on George Street, a short bulimic hurl from the home to fashion bible Vogue. There are only two reasons I don’t work at that magazine of course: I have little interest in fashion and I’m not a size 4. But if I did, I’d be struggling to maintain my soigné figure. I’d be eating Anthony Demetre’s food at least 3 times a week. The menu of the day is at first sight a steal at £28. There are two choices on each course but before I could choose, a generous mini-loaf of warm sourdough arrived to take the edge off waiting. I felt bad that a whole baby bread had been heated for little old me but the waiter seems un-phased by this generosity. Instead as I stuffed my face with the now butter loaded bread he offered up a long explanation to how the restaurant’s water is filtered on site and has a low carbon footprint. I realise too late that he had verbally bedazzled me into saying yes go what amounted was tap water in a bottle with what amounts to a 99% gross margin. I was only mildly surprised when it ended up on the bill at £2.50. I seemed to be the only solo in a chatter of mostly colleagues. No illicit affairs as far as I could see and my position on a fairly solitary table made eavesdropping nigh-on impossible. My enormous nosey was only mildly out of joint. But having become bored speculating about the May to September thing across from me, I did find myself thinking that this was a restaurant to which I could have brought C. We did once go to Arbutus, Wild Honey’s sister restaurant. Memorable for great food and my car being clamped on Soho Square. I remember sending a very tired C home in a cab while I waited 2 hours for the clampers to return. It gave me plenty time to work out that I had habanero chilis in a shopping bag in the back of my car. A couple may have been crushed and rubbed the clamp’s padlock. I can’t be sure…honestly. I have no memory of doing something so dastardly…. 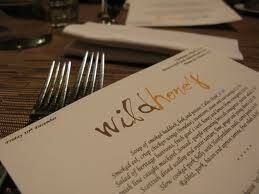 Anyway, as I say C would have liked Wild Honey because while it has atmosphere, it isn’t too noisy. I know I sound like a blue rinse has replaced my caramel highlights, but I used to roll my eyes and discard restaurants based on potential decibel levels. If I didn’t he would spend the evening in a grump, frustrated at having to lip read when he’d rather be staring at my cleavage. Now, as the gaping maw of middle age is stares me down, I’m beginning to feel he had a point. I like a restaurant with a comfortable chair and an acoustic conducive to conversation and what’s more, I’m not ashamed to admit it. And while I’m at it, I don’t like queuing either. God it feels good to say all that out loud. But back to C and his once petty now post-mortem, endearing qualities. As I was thinking about how he might have liked it here, I realised he’d been very much in my thoughts these last days. That’s not to say he’s not always there with me at some point of the day or night, but we’re heading into that time of year where it starts to get a little harder and the memories have a serated edge. In the same way that May reminds me of the anxiety of exams, and September the counterpoint of summer’s end and new terms starting, over the last four years the evocative nature of this particular time of year has not dimmed. I think it’s because the visceral shock of the loss, somehow amplified the weeks, days and hours leading up to that terrible moment. They became imprinted. The suddenness heightened the reality of all that precious and soon-to-be-lost time. My very cells seem to remember each day like it was a moment ago: The day we went on holiday, the day we heard Michael Jackson had died, the day we watched the last episode of the Sopranos, the day we went beach combing for silver dollar shells on Parrot Cay. The day the storm clouds rolled in on the beach, inspiring C to paint for hours….The were all added to long list of ‘lasts’ that became imprinted on my heart. Back in Wild Honey and my melancholy is mercifully pricked by a bowl of summer arriving. A perfect vegetable veloute, served chilled with tangy slivers of olive, oily crunches of hazelnut and sharp bursts of sour pink grapefruit. I’d have probably like it even more without the grapefruit but it cheered me up just to look at it such was its sunshiny qualities. It was soon followed by a perfectly portioned roasted spring chicken served in a skillet. Alongside a mound of unassuming risotto. I plopped a spoonful on my plate and licked the spoon (one of the many joys of eating alone – licking the serving spoons). I was hit with an intense flavour rendered no doubt not just from a gentle boiling of a poulet’s carcasse. More likely the tireless reduction of roasted wings and aromats over hours and hours. 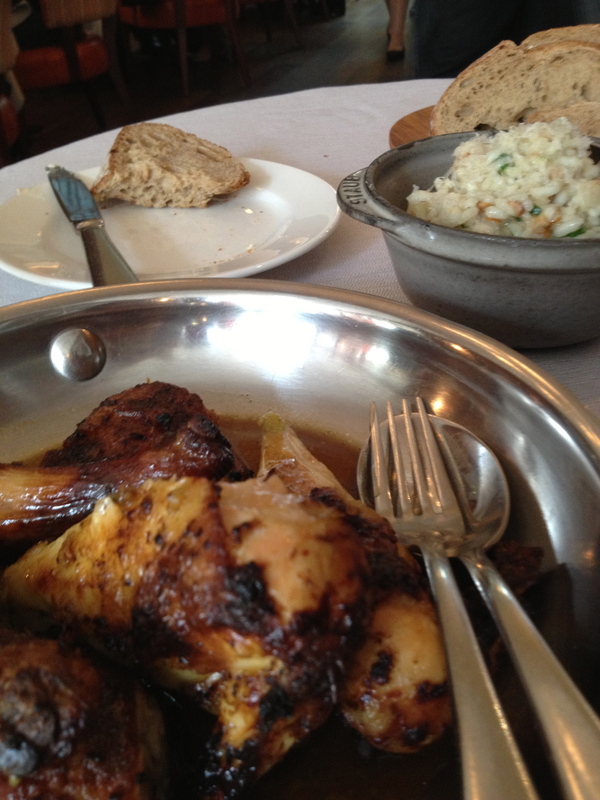 An even more addictive jus was drizzled over the chicken I discovered as that spoon too was licked down to the metal. With a careful addition of wild mushrooms (girolles I think) and a flecking of tarragon, the risotto and chicken were a union made in the realms of ambrosia, not just milk and wild honey. 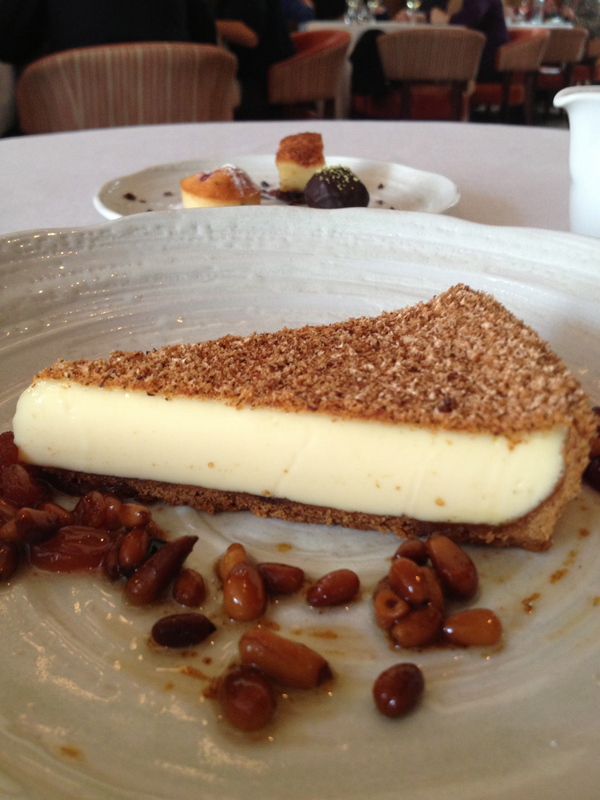 Pud was a nutmeg scented custard tart. Pastry, Bajan beach brown and thinner than a Vogue model’s ankles. Served with a coffee it was the end of a pretty perfect lunch. The bill ended up on the steep side thanks to the water and a somewhat splutter inducing £4.95 for coffee although I should say some unwanted but devoured petits fours did hit the table too. But somehow, I didn’t begrudge a penny. It was lovely and there’s something comforting about still finding restaurants that C would have liked. Maybe it’s time to find someone else to make happy…I suppose there’s worse things I could do.